Microsoft’s new design language for Windows 10 is Fluent Design, which they first announced at Build 2017, and first seen in the Fall Creators Update which shipped at the end of 2017. Fluent Design is based on the five concepts of light, depth, motion, material, and scale, and we saw several glimpses of this with the previous update. For the April Update, Fluent is now much more integrated into all experiences with the OS. On the Start Menu, for instance, there’s a lot more use of lighting to track where the mouse is. It not only looks fantastic, it’s also more usable. This carries into the title bar of apps as well, and coupled with the acrylic blurring effects, keeps the OS looking fresh and modern. Speaking of the Start Menu, it’s a subtle change, but there’s now shortcuts to documents and photos on the left side of the menu, by the Settings icon. And what’s more, this list can be customized to include or remove File Explorer, Settings, Documents, Downloads, Music, Pictures, Videos, Network, and the Personal Folder - which goes to Users\<username> - and each has their own unique icon. This is a nice setting to quickly get to where you often need to go in the file explorer. It would be nice to be able to add your own folders here though, or at least customize the ones that exist now. If you use your OneDrive photos folder, for instance, the photos shortcut can’t be changed to that, which is a shame. Another small tweak is you can access an app’s settings page by right clicking it in the Start Menu. That’s handy, but if you have it pinned on your task bar, that doesn’t work, so it would be nice to see more consistency in how the right click menu works. When Windows 10 first launched, it kept the old Control Panel from Windows 8 and previous versions intact, and easily accessible, since many of the settings still had to be configured through it. Over the years, more and more features are being moved from the legacy Control Panel to modern Settings panels. This is sometimes a mixed blessing. The entire Settings is searchable, so it’s often much easier to find obscure things you might need to tweak, but at the same time, functionality can sometimes be removed during the transition to make it cleaner. With the April Update, one of the oldest settings ever still in Windows has finally been updated: Fonts. The interface to install Fonts in previous versions of Windows was literally right out of Windows 95 era, but now it’s all modern, fresh, and fluent. 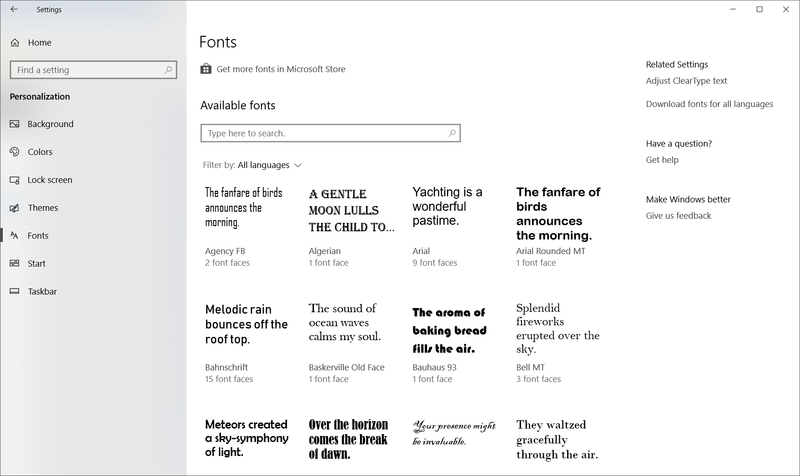 Fonts can be installed either by using a TTF file, or through the Store, and Fonts can be removed through Settings. 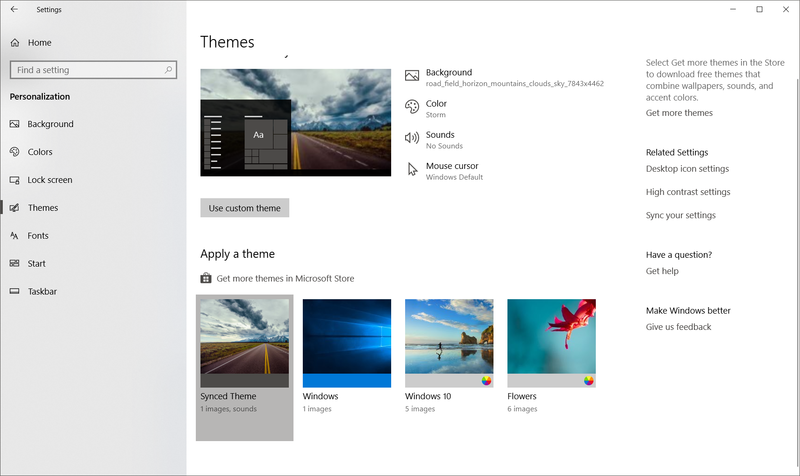 Windows 10 now supports themes in the Store, and can be installed and managed through Settings. Hooray! Microsoft has somewhat backed away from its very annoying policy when Windows 10 first launched, where the system would just randomly decide you weren’t busy, and reboot for updates, even if you were right in the middle of something, and the last couple of updates have added notifications and scheduling options. They still want everyone to be patched, but the latest update is less intrusive here. You’ll get notifications when updates require a restart, and you can easily schedule a time right in the notification. In addition, big feature updates like the April Update should install quicker than before. This has been an ongoing project though, and hopefully improvements will continue. This came with the previous update and we didn’t notice it, but you can finally set how much bandwidth is allocated for updates, and set how much upload bandwidth you’ll allocate for updating PCs on the internet, and cap how much you upload. On a shared network with a less than amazing internet connection, one PC that checks for updates can kill the internet connection for everyone, so this is very welcome. You can also monitor the download statistics for updates, and see how much of your updates are coming from Microsoft, as compared to machines on your network, or PCs on the internet if you have that enabled for some crazy reason. 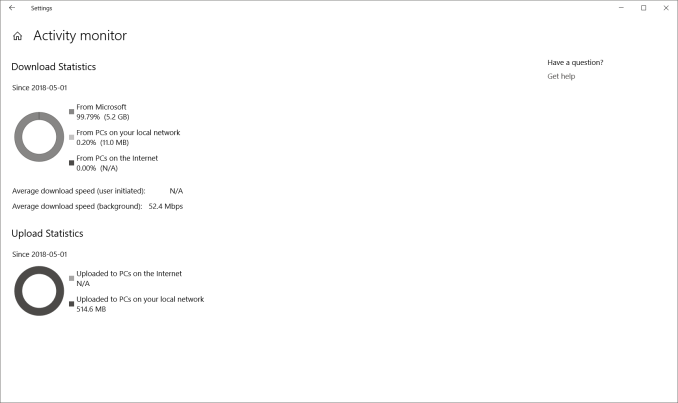 Microsoft has taken a more aggressive default option on telemetry with Windows 10. They want to own the experience with Windows, so if a device driver is crashing PCs, telemetry would let them know anonymously that a device is causing issues, and they can work with the vendor to get a driver update created. This is exactly how a mobile OS works, of course, but it’s not something we’ve been accustomed to with the PC. 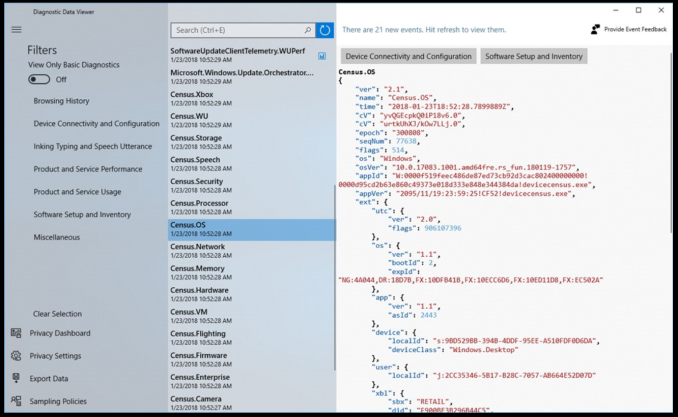 Telemetry has been a thing for a while, but there’s no doubt that Windows 10 had very lax default policies to ensure it was enabled for most users. This has rankled some customers though. They want to know what is being collected, or turn it off completely. You still can’t turn it off completely, but with the April Update, there’s now a way to view your diagnostic data, and to delete the data on the PC. Microsoft now offers a free Diagnostic Data Viewer in the Store which lets you view everything that’s collected.